As mentioned in a previous post, Steed were actually the very first tailors on Savile Row to have their own website way back in the 90's, when unlike America, the internet in the UK was still in it's infancy. 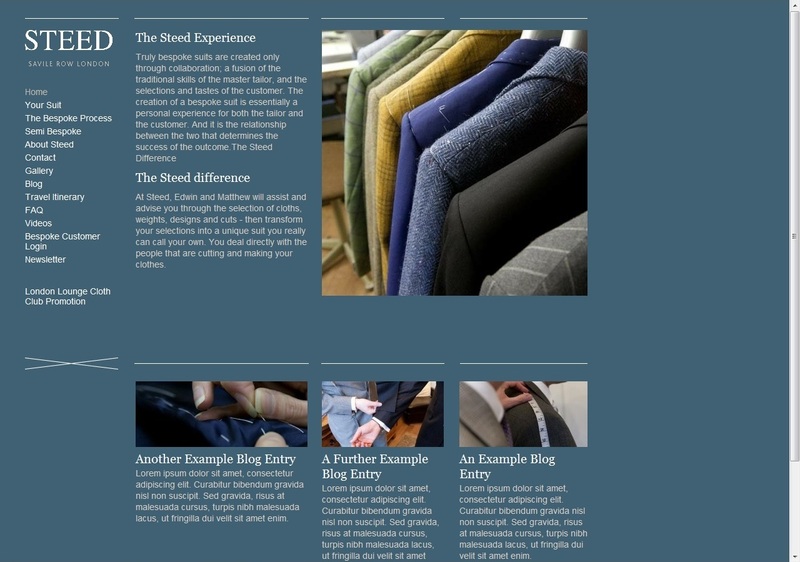 One of which was a unique feature which we are sure might again be a first for Savile Row! Its is a bespoke customer login. This feature is available to all of our bespoke customers and their username will be their email address and a password of their choosing when they register for the feature. This will allow access to their own personal space on our site and will be able to track current orders that are in process through a interactive time-line. Matthew will be updating the system as the customers suit is going through each process. Much like we documented various stages through our blog episodes called "A Work In Progress"
There will be a standardised format of text that will explain each stage but the photo's will be unique to that order. For example you will see photo's of your own paper pattern, and the cloth that has been chosen being cut. Each customer will be able to post comments and questions in a box at the bottom of their personal page which we will reply to asap. Also the blog will now be moved permanently to the new site so this will be the last post here on Steed's View!